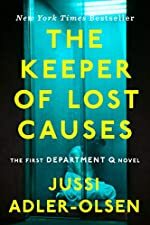 From Mysterious Reviews: The police procedural aspect of the book is excellent, with the pieces of a missing person's puzzle all contained within a five-year-old cold case file. It's a real pleasure following Mørck along as he puts them together in an effort to locate the woman in the cage (the original Danish title of this book). Synopsis (from the publisher): Carl Mørck used to be a good homicide detective — one of Copenhagen's best. Then a bullet almost took his life. Two of his colleagues weren't so lucky, and Carl, who didn't draw his weapon, blames himself.